Northwestern's new Audiology Clinic in the School of Communications is a facility for research, education, and clinical treatment that is daringly embedded in a parking structure with painstaking attention to the attendant isolation challenges as well as exacting requirements for interior acoustics and AV systems. In addition to the isolation booths for both therapy procedures and the fitting of hearing aids, the Clinic includes two unique spaces considered for pedagogy and treatment. 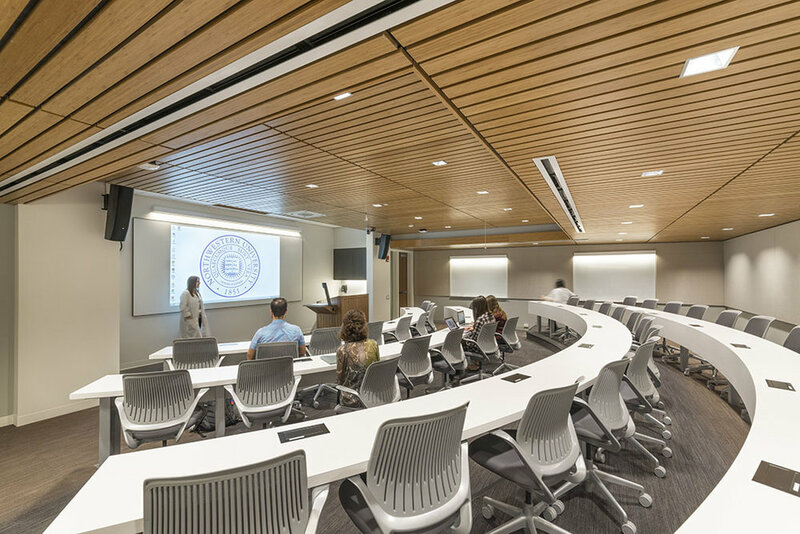 The tiered, 50-seat Diagnostic Theater is a venue for observing clinical procedures, with distance-learning systems extending its reach to far beyond the Theater itself. The Audiology Rehabilitation Room, known as 'ViSoR', uniquely applies an electronic enhancement system to generate moving sources in simulated aural environments – from pastoral settings to urban streetscapes and crowded restaurants – helping clinical patients re-train their ears as part of their treatment. ViSoR's potential in this regard has made it a magnet for auditory research as well.